Maybe that’s why I find Ed’s technique comfortable because I normally pick lead stuff with my middle finger and thumb. He had found his meal ticket. Otherwise, before that time, he held it just like the rest of us slobs. He used to point out in early interviews, how he ever so cleverly tucked his pick in his middle finger joints, so he could do that excellent tapping thing, with his free index finger. I always played with my thumb and middle finger on the pick for leads, it had nothing to do with Ed. That’s just what I did when I started playing because I felt like I had more control picking individual notes like that. I didn’t even realize Ed played that way until I really watched him years later. 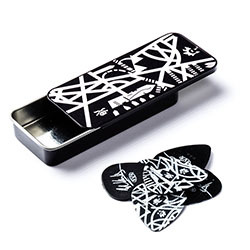 And it does make it convenient to tap with your first finger and tuck the pick away. I did it so mindlessly I didn’t even realize it. But what’s funny as I’ve gotten older I notice now that I’m holding the pick with my first finger and thumb on almost all my leads. At some point it just changed for me it’s really weird, I don’t know even know when it happened. I don’t even think I could tap with my middle finger, just don’t have the control. I still always tap with my first finger and tuck the pick under the middle finger. You might be a wizard on the frets my friend, but no one rules these boards like me! The Atomic Gif'er!! Ah yeah!!! Waaaa aaaaaa aaaah!!! Yup. Tapping with the index finger allows your other fingers to grab the neck, offering more control and stability. I find it way more accurate, way more precise, and just overall more professional looking. Yet the middle finger is the strongest and you don't have to 'lose' the plectrum, which ensures a seamless transition from picking to tapping and back again. Obviously there are pros and cons to each method. Different strokes, or in this case different taps. Yeah, I've never cared for the middle finger tapping myself, but the cool thing about guitar and music in general is that there are no hard and fast rules (other than play in tune) and the canvas offers unlimited possibilities based on our own personal interpretations, strengths, and weaknesses. If someone prefers to use the middle finger and it works better for them, more power to them. I could pick with my middle, and tried that picking before I lost a half inch of my ring and middle finger tips, but it woulda took a lot of practice. If I had to retrain for middle finger picking I probably could, even with a huge nail there instead of a finger tip, but I finally comfortable how I'm playing, so, I'll just stand pat and try to get better how I play.